Now, the Marine Conservation Area (KKP) of Nusa Penida and Lembongan Bali are getting new problems due to the growth of tourism activities. The problem is that coral reefs along the coast are continuously harming the damage. 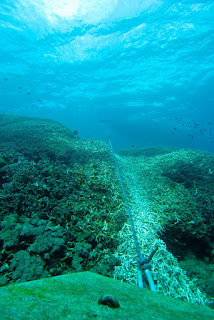 After the destruction of coral reefs by a number of tourists, and the destruction of coral reefs with the bleeding effect of climate change, there is now the destruction of coral reefs due to pontoon pontoons. Two things that are dominantly visible are the shrinking pipe weight of the pontoon rope, dragging the ocean currents and causing the coral reefs to crumble. Also a number of tourist aids, underwater paths of concrete and iron are placed on a stretch of coral reefs. This type of branched aropora coral is susceptible to this physical stress being broken. It is found in the most severe areas of damage ie Mangrove Point, Nusa Lembongan. Initial information is rumored that environmentalists and divers in Nusa Lembongan Bali (one of the islands in Nusa Penida cluster). Nusa Lembongan is the location of coral reef damage identified to date. There are photos of the destruction of coral reefs allegedly caused by pontoon-bound concrete that dragged ocean currents. So that hit the coral reefs in the seabed. Damage to coral reefs occurred due to the tourism managers are considered to have neglected and neglected to the impact of coral reef ecosystem damage, for the benefit only, including the weak supervision of relevant agencies that oversee tourism activities in the region. Monitoring results show the damage of coral reefs due to the movement of concrete based on the sea where the moorings and the material of the tourist facilities, it has occurred in Mangrove Point Nusa Lembongan Bali. 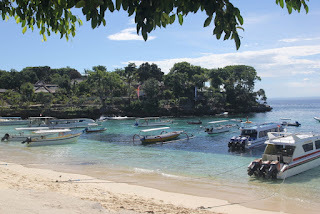 Damage to coral reefs in the area of Nusa Penida and Lembongan Bali raises the concerns of many parties, the impact of the development of marine tourism destinations in the region. Someday this area is likely to be abandoned tourists, so that the dim potential tourism Nusa Penida and Lembongan Bali. When strict action is required on tourism managers who are proven to cause coral reef damage to ensure that damage does not occur continuously. There are at least 6 pontoon at Mangrove Point, a conservation area that should be sterile from anchor activity or ship mooring. Each shipowning company has its own pontoon, and each business has more than one ship. While the zoning is clear, the area that may be used and not. Along the mangroves there should be no pontoon including permanent and semi-permanent accommodation. But the fact is there is a year of ship belching activity in the middle of the sea that eventually proved to damage the coral reefs. Pontoons of concrete and iron are attracted by ocean currents and easily break the corals around the pontoon. The ships that bring tourists looking for an instant road by throwing anchors at the snorkeling and water sports mangrove point. In addition to the impact of anchor and concrete pontoon binding, there is also a seawalker tourism practices or running under water with a special tool that tadak in accordance with the area, because under the sea coral cluster is not sand. So the tourists have to walk among the coral reefs which consequently damage the ecosystem. For the prevention of increasingly severe and long-term damages, there must be regulation about the capacity of tourists to the Nusa Penida KKP. So it can be known how many pontoon needs and other means not to damage the coral reefs.